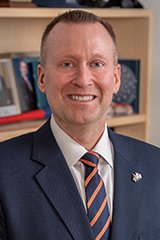 Dr. Mike Haynie is Syracuse University’s Vice Chancellor for Strategic Initiatives and Innovation, and also the Barnes Professor of Entrepreneurship. As Vice Chancellor, Dr. Haynie leads a broad portfolio of responsibility centers and innovation initiatives, including the University’s robust portfolio of entrepreneurship and innovation programs, and cross-campus efforts to develop and enhance academic offerings for online and nontraditional students. Haynie also oversees the University’s government and community engagement strategy, as well as defense- and veteran-connected programs and initiatives across the Institution. In 2018, Syracuse University named Haynie a University Professor, the most senior rank awarded to faculty at the University. Over the nearly 150-year history of Syracuse University, the institution has honored less than twenty individuals with the rank and title of University Professor. Haynie is also the founder and Executive Director of Syracuse University’s Institute for Veterans & Military Families (IVMF), the nation’s first interdisciplinary institute created to inform and advance the policy, economic, and wellness concerns of the America’s veterans and families. Today IVMF programs serve over 25,000 veterans annually, and the Institute is widely acknowledged as the nation’s leading academic voice related to issues impacting veterans and military-connected families. In 2013, Dr. Haynie’s efforts on behalf of veterans were the subject of a feature story by the CBS news magazine 60 Minutes, titled “Succeeding as Civilians.” Haynie is regarded as one of the world’s leading scholars related to entrepreneurial decision-making and strategy, and his research has been published in many of the world’s leading entrepreneurship and business journals. Dr. Haynie currently serves on the editorial review boards of the Journal of Business Venturing, the Strategic Entrepreneurship Journal, the Journal of Management Studies, and is an associate editor for the Journal of Military, Veteran and Family Health. Over the past decade, his academic work has consistently garnered significant federal, state, foundation, and philanthropic funding. Dr. Haynie has received numerous awards for his scholarship, teaching, and community engagement, and he is routinely called on to advise private and public sector leaders on issues related to small business, innovation, and veterans. In 2013, Haynie was appointed by the Obama Administration to serve as the Chairman of the U.S. Department of Labor’s Federal Advisory Committee on Veterans’ Employment and Training. In 2015, the White House asked Haynie to serve again, this time as the vice chairman of a newly created Presidential Task Force, chartered to set the course for long-term reform at the U.S. Department of Veteran Affairs. In addition, Dr. Haynie is a current appointee to the CNBC Disruptor 50 Council – a group of world’s leading thinkers in the field of innovation and entrepreneurship, who each year identify the 50 new ventures most likely to disrupt established industries and markets. Haynie also serves on the Scientific Advisory Board for the Naval Health Research Center’s “Millennium Cohort Research Study,” and on the advisory board to the Corporation for Public Broadcasting’s Veterans Coming Home project. Haynie’s academic and advocacy work is often featured by the media, to include on the ABC Evening News, CBS News, CNBC, CNN, and Fox, and in print at outlets such as the New York Times, the Los Angeles Times, INC Magazine, the Wall Street Journal, Forbes, the Chronicle of Higher-Education, Fortune, and Entrepreneur Magazine. Dr. Haynie is also a frequent contributor of opinion editorials to major media outlets that have included the New York Times, The Hill, the New York Daily News, PolicyMic, the Philadelphia Inquirer, and the Wall Street Journal. Haynie completed his PhD in Entrepreneurship and Business Strategy at the University of Colorado at Boulder, and his MBA at the University of Oregon. Before beginning his academic career at Syracuse University, he served for 14 years as an officer in the United States Air Force. Professor Haynie's research is focused on investigating entrepreneurial decision-making, identity, and cognition. His research has been presented at the top entrepreneurship conferences and published in prestigious academic and industry journals.